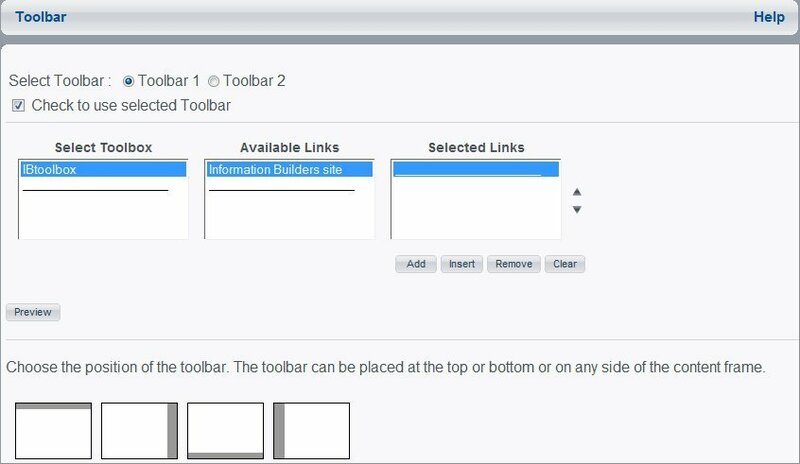 You can insert custom toolbars in views that can contain any type of link that the Internet or intranet supports, such as web sites, other tools, applications, and documents. When a user clicks one of the links, a new browser window opens and displays the contents. Toolbars can be placed in various positions and you can select different colors for the toolbars so they fit in with your Dashboard look. For details on selecting colors, see Selecting Custom Colors. You can have up to two toolbars per view. The number of items a toolbar can contain is only limited by the display space. Toolbars do not scroll, but you can maximize your space by positioning the toolbar appropriately (for example, a vertical toolbar can contain more items than a horizontal toolbar in most cases). Since toolbars are created from items in a toolbox, you must create a toolbox before you create a toolbar. You can create as many toolboxes as you require and each toolbox can contain an unlimited number of items. Once a toolbox is created, it is available in all public and group views. From the View Builder, click Toolbox. The Toolbox window opens as shown in the following image. Below the Select Toolbox list box, click Add. Type a name for the toolbox in the Toolbox Name field and click OK.
Toolbox names and link captions are limited to alphanumeric characters only. Toolboxes are stored in the ibi\WebFOCUS\worp\conf directory with a .tbx file extension. The file is given a default name based on the current date and time, so every toolbox has a unique name. This does not affect the display name you type in the Toolbox Name field. In the Link Caption field, type the name for the link. This is the text that displays in the toolbar. Click Insert and the link is added to the Available Links list box. Click Clear and repeat steps 4 through 6 to add additional items to the toolbox. The number of items you can put in a toolbox is unlimited. Select a toolbox from the Select Toolbox list and click Save As. Type a name for the new toolbox in the Save Toolbox As... field and click OK. Note that toolbox names and link captions are limited to alphanumeric characters only. The Toolbar window opens, as shown in the following image. Select the Toolbar 1 or Toolbar 2 radio button. Select the Check to use selected Toolbar check box. Select a toolbox in the Select Toolbox list. From the Available Links list, select a link and click Add. Repeat steps 3 and 4 until your toolbar is complete. Use the up and down arrows to the right of the Selected Links list box to position the order of the selected links. Select the toolbar position (top, bottom, left, or right) by clicking the appropriate image at the bottom of the Toolbar window. You may need to scroll down to view these images.